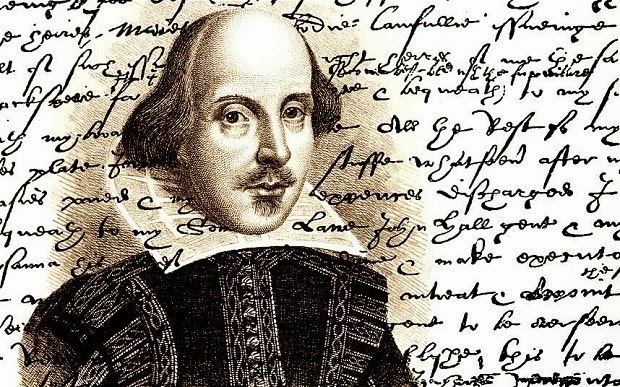 Humour, whether visual or Proverbs (and ideally both) can provide useful memory joggers for a Project Manager to apply at work whether undertaking a PM discipline or interacting with team-mates or even senior stakeholders. 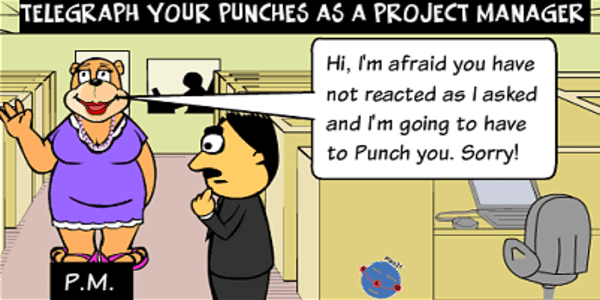 I am a great proponent of this approach as my project team-mates will testify! You will find such humour across all my Be a Better Sheepdog blog posts but hopefully with some useful messages too. 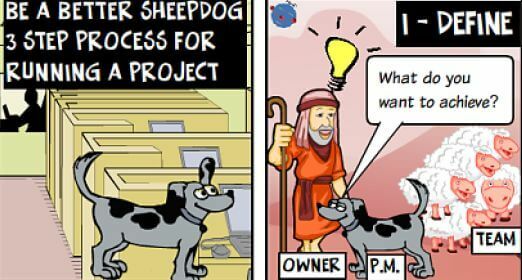 Most Project Managers are time poor and need to think on their feet so I am a strong believer that Proverbs, Pictures and Humour can help you retain good principles in your head. I have even looked at the science of memory which I believe backs my theory. I expanded on this within a post I wrote for the Association for Project Management. 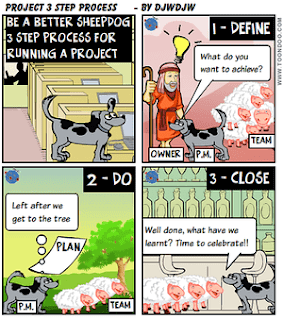 I have put together an alternative Proverb based Project Management manual for those of you that find the PRINCE2 manual or PMBOK rather long and dry reads. So if you want to see lots of cartoons, proverbs and few words, have a look. Enjoy! 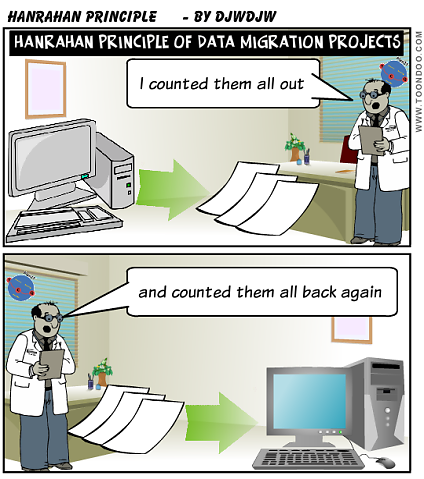 If you are ever running an IT Data Migration Project you should always remember the Hanrahan principle which will need a little of explaining for anyone who isn't British and older than 45. The principle is that you should do checks on record counts in the source system and the target system to ensure they are explainable after the migration process. In some projects not all data will be migrated, it depends on the business requirements. But always check that the requirements have been well specified and met in test and live runs. So there should be counts of records that meet the migration requirements and counts of records which have been rejected because they don't meet requirements. The sum of these should match the total record count in the source system. Brian Hanrahan was a BBC correspondent who is probably most famous for one quotation when reporting on the Falklands War in 1982. He was on the aircraft carrier HMS Hermes and was not allowed under Government reporting restrictions to say how many Harrier jump jets had departed on raids. However he wanted to reassure the public that there had been no losses. Your whole project plan is often geared to a key decision point - the Go / No Go meeting which agrees whether the project move into implementation and roll-out. This meeting is normally very close to the planned implementation and often has a large attendee list with senior stakeholders which are difficult to reschedule. Therefore it is important that good preparation occurs and the correct decision is made. I'll take you through my approach in this post. You might think that the meeting outcome is binary but in my Go/No Go meetings there are 3 possible outcomes and this is often useful to keep the project on track. Implementation Plan fully approved & resources for implementation event secured? If you can secure the evidence against each criterion in advance of the meeting you are well placed for a Go decision. So in the example above, secure the appropriate sign-offs of the Test Completion Report and there should be no discussion on testing in the meeting. If the report highlights some residual risks then this should be included in your risk assessment part of the meeting. Create a document with a RAGB status against each criteria based ideally on an objective assessment else make a judgement. 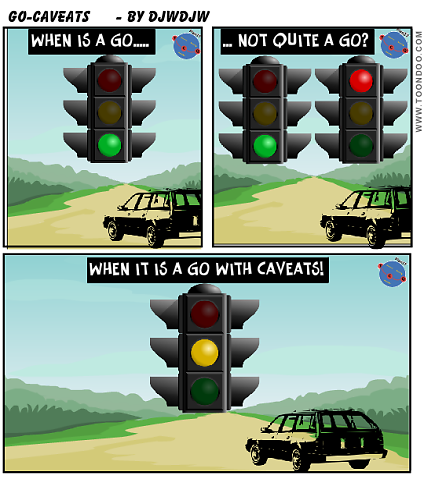 Blue is a colour I use to indicate complete, Red, Amber, Green depending on how much concern the item is for the Go decision. 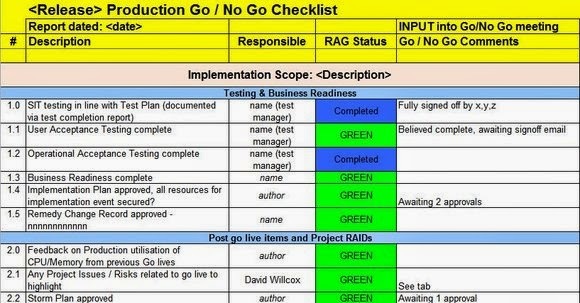 Use this document to manage within the project team as you approach the Go / No-Go meeting - the trick is where things aren't Blue or Green to have side discussions in advance of the meeting. Walk through the document criterion by criterion and allow any discussion although for completed items you shouldn't expect much. Once you have been through the whole list, you need to populate the voting section of the document. I always like to start the voting and by so doing, lead the meeting. I try very hard to be objective and not just say Go as I believe demonstrating a proper objective view gives confidence to other stakeholders. Going live and having a host of problems not highlighted as risks at the meeting won't be good for your reputation. Again, the trick is to work hard before the meeting to ensure you are in the best possible position to say Go although my reputation is that I always vote "Go with caveats" as there is often a sign-off or two still to be chased down! I always like the sponsor to finish the voting and frankly this the most important vote which should prevail in 99% of meetings. The sponsor can listen to the other votes and where necessary make a judgement call. Send out the updated criteria / voting with the outcome from the meeting. If the outcome is Go with caveats or No Go, document and send out the actions arising from the meeting. 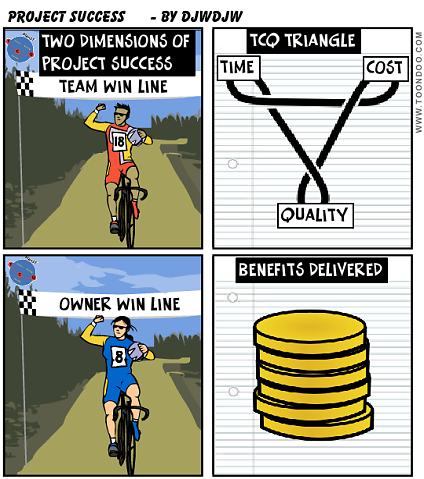 The Go / No-Go meeting is a critical milestone in your project plan. Good planning and preparation can give you the best opportunity of getting the correct decision. I commend the framework described here as an effective approach which I have used for many years now. On one project with many roll-outs I was having up to 3 such meetings a week but it worked effectively to get the right decision and equally important, obtain buy-in from key stakeholders.